Jan 10. 2018 - Gulf Medical University (GMU) – Ajman, a leading medical university in the Gulf region has been awarded five-star ratings for four key categories by QS, the top international university ranking agency. 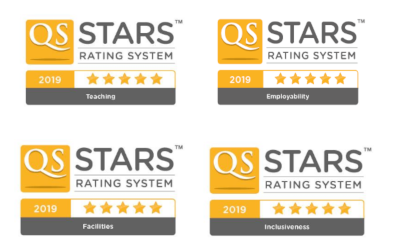 The University has achieved five-star ratings in the categories of teaching, employability, facilities and inclusiveness, according to the latest data published in 2019 by the agency. GMU has evolved as one of the most popular medical universities in the region, drawing students from more than 80 countries and faculty/researchers staff from over 25 countries. Located in Thumbay Medicity, the hub of cutting-edge healthcare technology and services, GMU has always been at the forefront of innovation in medical education, healthcare and research. Prof. Hossam Hamdy, Chancellor of GMU said that the high QS ratings has consolidated GMU’s position in quality of medical education in the region. “We are happy that Gulf Medical University’s relentless pursuit of quality in medical education has once again been recognized at the global level, underlining our commitment to producing the medical professionals of tomorrow. The fact that we have secured the highest ratings in the key categories of teaching, employability, facilities and inclusiveness is a testimony to our all-round excellence in Health Professions Education”. The six colleges of GMU, College of Medicine, College of Dentistry, College of Pharmacy, College of Health Sciences, College of Nursing and College of Healthcare Management and Economics offers 25 programs fully accredited nationally and internationally. The university collaborates with many leading International Universities worldwide offering training opportunity to our students in US, Europe, Asia and Middle East such as the University of Arizona, Virginia Commonwealth University, Medical College of Wisconsin in Milwaukee - USA, University of Saint Joseph School of Pharmacy in Connecticut, German Heidelberg University, American University in Cairo, University of Ghana, Medical University of Lublin, Tokyo Medical & Dental University, etc., as well as research institutes such as the Gustave Rossi Cancer Research Institute – France. An important aspect that differentiates GMU is its use of the latest technologies in teaching and training students across all its programs, to ensure their workplace readiness once they graduate. The Gulf Medical University Academic Health System (GMUAHS) – the first of its kind in the region’s private sector - links the healthcare, medical education and research functions into an Academic Healthcare System. This was one of the important factors contributing to the 5 Stars recognition of GMU. GMU has considered Research as an important strategic direction. The Thumbay Research Institute for Precision Medicine leads research in the field of cancer biology and immunology, with international collaboration with France, Poland and Korea. In 2017, GMU was ranked among the top 50 medical universities in the Middle East according to the US News & World Report. It bagged the Gold Award at the prestigious Sheikh Khalifa Excellence Awards, 2018. The University also received the prestigious Dubai Quality Appreciation Award for the 2017 assessment cycle.